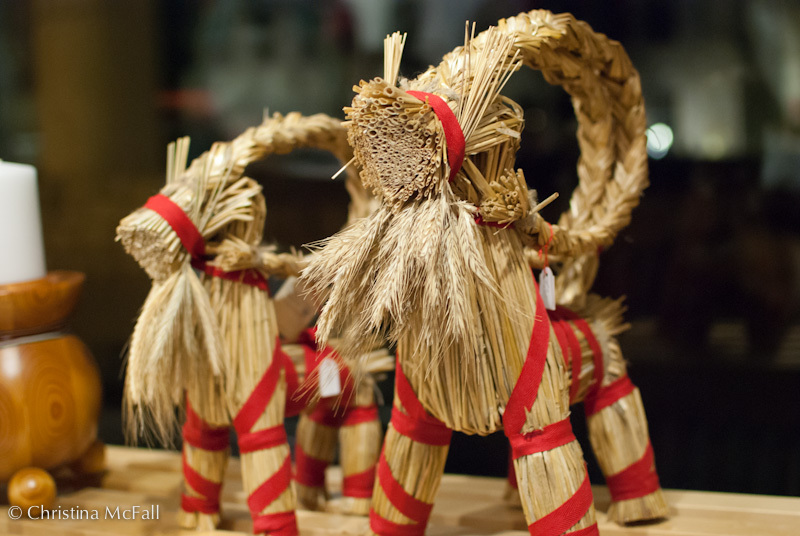 I saw these straw goats at the Swedish & Norwegian Christmas market a couple weeks ago. I’m a big fan of traditional strawwork and I absolutely adore these goats. They are another popular yuletide motif here, even though they are very scandinavian. Straw yule goats are apparently a very old traditional, and you can read more about them at Yule Goat on wikipedia. I also discovered, that the town of Gavle, Sweden, constructs a massive yule goat every year. The famous goat of Gavle has his own blog (written in first person) and a live webcam feed. Sadly, a giant goat made of straw is too tempting a target and often gets burned down before christmas… this year vandals burned him down on Dec 13th. But he’ll be back next year!